PETALING JAYA: Up-and-coming developer, Trinity Group Sdn Bhd, is on the lookout for more strategic land in the Klang Valley to develop affordable niche boutique projects. Managing director Datuk Neoh Soo Keat said the developer was also looking for opportunities in the other active growth markets of Penang and Johor. “Hopefully in the next two to three years, we will be able to launch a project in Singapore also. To do that, we will need to tie up with a good Singapore partner,” Neoh told StarBiz. Since it undertook its first development, The Heron Residency in 2004, the company has launched 2,010 property units worth some RM920mil, of which RM320mil have been completed. It has an undeveloped land-bank of 8ha and a further 7.3ha in the Klang Valley that are under construction. Neoh said the company hoped to achieve sales of RM520mil this year and RM640mil in 2012. Last year, it recorded RM50mil worth of sales, and its record sales so far were RM250mil in 2009. While admitting the worsening external economies may affect market sentiment, he said the impact would be more severe on the high-end property market, while the medium-priced sector should be better cushioned against the softening outlook. Trinity is targeting RM1.33bil worth of new project launches over the next two years. They will comprise residential and commercial projects in Melawati in Ampang, Bandar Putra Permai in Seri Kembangan, USJ 19 in Subang Jaya and Bukit Antarabangsa in Hulu Kelang. The company plans to build condominiums on its 1.4ha freehold tract in Melawati with an estimated gross development value (GDV) of RM180mil. The projected GDV of the Bandar Putra Permai project on 1.5ha is RM300mil, the 1.2ha USJ 19 project is worth RM200mil and the Bukit Antarabangsa project on 3.5ha is worth RM700mil. The response to its latest project, the Z Residence condominium in Bukit Jalil, has been good with some RM350mil of the RM500mil development sold since its soft launch in April. The project comprises 1,136 condominium units on four towers of 26 and 27 storeys on a 2.7ha freehold site. The first two phases, Towers A and B, featuring 590 units priced at an average RM340 per sq ft (psf), were sold out within a month. The subsequent phase, Tower C featuring 281 units with built-up ranging from 1,032 to 1,407 sq ft, fetched an average price of RM380 psf. So far, it is about 65% sold. The final block with 265 units will be launched next month. 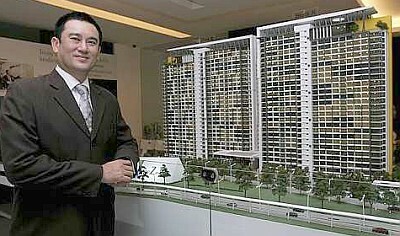 Neoh said that to address the concerns of nearby Bukit OUG Condominium residents over the high-density nature of the development, which may cause traffic congestion in the area, Trinity would build a 800m link road costing RM3mil from the project site to Bukit Jalil highway to alleviate traffic congestion in the area. It is also taking measures to reduce pollution during construction.